Recently, I got my hands on the EMC vnxe 3100. It’s a great SAN solution for SMBs, and very easy to setup and administer. Having worked mostly with Equalogic and HP SAN solutions, The Unisphere interface on the EMC VNXe’s was refreshing and simple. Couldn’t be easier. EMC ships a handy quick start guide, with full color pictures (you aren’t going to read anything anyway). They also include labels to be applied to the cabling on the back – not need to supply your own. After connecting power, network, and then attaching the second cabinet, it was time to power on. Using the VNXe’s Connection Wizard, the 3100 was found and it was given an IP address that I specified. Once I connected to the Unisphere webpage and logged in, I was presented with the Configuration Wizard. This helpful wizard walks though everything that is needed to quickly get this SAN into production. After setting passwords, DNS and NTP information, and iSCSI IP information, I decided to skip the Disk Pools setup, and do that manually. Finally, I the wizard asks for SMTP information and your EMC support credentials to register the device with EMC. I decided to update the VNXe first before I got started. Again, Unisphere makes this process very simple. Under the settings menu, I had the option for software update. Since I already had this downloaded, I was able to upload it from my laptop, and apply it. This was a live process, and updated one Storage Processor at a time and took about 25 minutes. The next step, was to setup my storage. Since I didn’t let the wizard do this, I had to manually setup my storage pool. Again, this was a simple process. The first step is to create a storage pool. Or, a “raid group”. Depending on your background, you may know it as either. Simply a collection of disks in a particular array. From their, we carve out actual LUNs to be presented to our hosts. Under the storage tab, I was able to create a VMware storage, which is a great wizard that walks you through picking what storage group to use, how much space to dedicate to the LUN, and how much space to dedicate to snapshots. Then, the wizard asks which ESXi hosts will have what type of access (I setup my VMware hosts earlier under the system tab, and Hosts.) Then, the process kicks off, and it will create the LUN, and actually have your ESXi hosts connect to it (since I provided unisphere with my vSphere credentials). The only drawback to this, is as of now, it doesn’t format the VMFS volume with VMFS5. But, at least it does use the 8MB block size regardless of the LUN size. 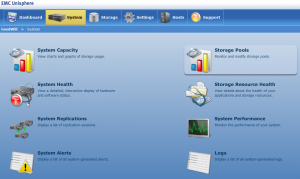 I actually deleted the storage from my Hosts, and manually added it again to format with VMFS5. (I didn’t want to upgrade since I wanted to use the universal block size). Performance varies. Obviously. This will depend on your number of disks in each storage pool, and what RAID they use. Here are some comparisons at least with Raid10(10 disks) and Raid5 (14disks). These use the standard iometer testing settings that the vmware community uses. See vmktree.org. I really like this solution. It’s a great box for SMBs. 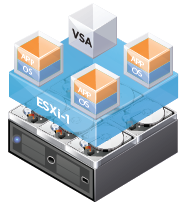 Those that need more speed can purchase the VMXe5300. It also uses the Unisphere interface. There are two things I find myself wishing thathe VNXe could do. 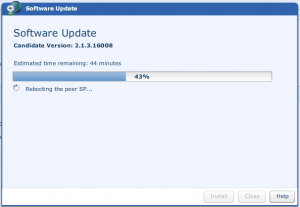 First, format with VMFS5 (I’m sure that will come in an update). And second, support read only access to a LUN from a host. Right now, the permissions are Full Access, Snapshots Only, and No Access. Read Only would be very helpful for using Veeam in SAN mode. (Yes, it still can be done, but – I don’t want my windows box that Veeam is running on to even have the opportunity to initialize my LUN). the downside of the VNXe line is the controllers and the firmware on them. Might want to take a look at my post here http://jpaul.me/?p=3099 if you are thinking about using this in an environment that is sensitive to downtime.